Exceptional play value in this die-cast and plastic set. 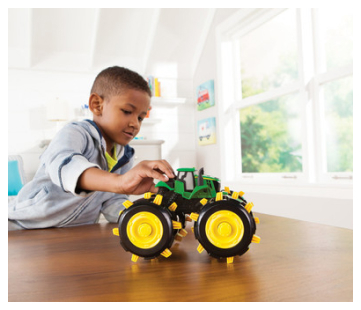 Featuring a 1:32 John Deere die-cast tractor and barge wagon, 8" Dealership pickup with detachable utility trailer, gator as well as two horses, three cows, round bale feeder, round bale and fencing round out this play pattern. The carpet farmer will love this set!